Refugees come to this country with an abundance of support to settle in the US, but a lack of resources to help them beyond attaining basic survival needs. They come to America with limited English abilities, no native community support and little exposure to networks to practice English with Americans. Our team wanted to enable refugees with aspirations towards economic self sufficiency by reducing 2 major roadblocks that refugees face when aspiring towards attaining higher paying jobs, learning english and social connections. 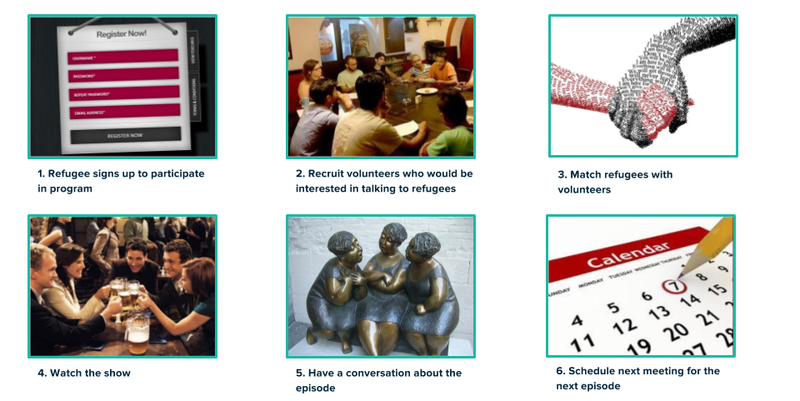 We learned by conducting user research with former and current refugees, that American TV shows not only alleviated some of their stress and hardship, but that this is the primary way that refugees learn and practice English. We believed that by connecting refugees within similar communities with facilitators from spnosoring tech companies to watch & converse about popular American TV shows and movies, they will improve their ability to converse in English, gain community support, increase American culture immersion, and build networking skills to improve social and career mobility. Partner Organizations (HIAS) to help in the selection of a group of participants (5-10) along with a sponsor company (Pivotal Labs). Participants register name, country of origin, age, english level, time available. Set up movie, name tags, small groups of refugees from a similar community to 1 native speaker. Introduction, meet & greet, hand our material (name tags, index cards). Participants view and writes down words and time stamps of things you want to discuss. Facilitator assist in conversation about the show, only in English. Retrospective and feedback (in English). Apply learnings for next iteration. We hope that a pilot will yield feedback to apply to more sessions and more sponsors. Our vision is that these meetups can be in person or virtual, as well as the library of shows and mediums can expand. Shows large categories and subtitled in their native language of content that they can select. When there is an event, user can see the event details and the sponsor and opt in, as well as see others who care also attending. A profile page will allow Anna, our persona, to see how many group chats she is joining and how many event meet ups she has opted into.